“I cannot express how excited I am to move to northern Michigan and become part of Riemer Eye Center. I look forward to connecting with patients, the surrounding businesses and the great outdoors for years to come,” says Dr. Connolly. 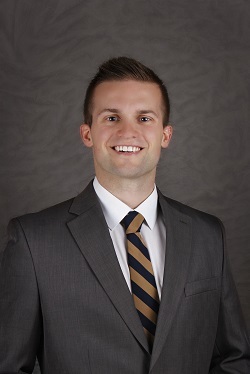 Following in the family footsteps, Dr. Connolly grew up in an optometry family and worked in their practice throughout his schooling. Dr. Connolly offers primary care optometry for both adults and pediatric patients through comprehensive eye exams, management of eye diseases, specialty contact lens fittings, diabetic eye care, low vision services and education. In May 2017, Dr. Connolly achieved his Doctor of Optometry at Ferris State University, Big Rapids. Undergraduate studies were completed at Michigan State University and Michigan College of Optometry at Ferris State University. He is a member of both the American Optometric Association and the Michigan Optometric Association. Dr. Connolly interned at the Aleda E. Lutz Veteran Affairs Medical Center in Saginaw and is also an annual volunteer for the Children’s Vision Day and the Michigan Special Olympics. Dr. Connolly enjoys exploring the outdoors, especially hiking, camping and golfing. He and his wife are originally from Southeast Michigan, but have chosen to reside in the Cadillac area to raise their family. About Riemer Eye Center Riemer Eye Center was founded in 1994 by Dr. Andrew Riemer, and provides a full range of comprehensive eye care needs for children and adults throughout Northern Michigan. With locations in Ludington, Manistee, Shelby and Cadillac, patients can receive the best eye care available close to home. In addition to medical and surgical eye care, Riemer Eye Center offers the area’s largest selection of designer eye wear and contact lenses. For more information or to schedule an appointment, visit , call (800) 974-2020, or stop by any of the four Riemer Eye Center locations.